The National Portrait Gallery, of which Kate is patron, drew up a shortlist of four painters but the duchess, who graduated from St Andrews with a 2:1 in history of art and previously studied at the British Institute in Florence, plumped for Mr Emsley. For more information and the latest update & news click the link below. We want to explore and identify all the possibilities therefore open the topic for response and comments that collective we could learn and benefit from this exercise!! Firstly from each member to confirm whether you accept the portrait painting by artist’s Paul Emsley achieved what he wanted to capture her ‘charm, serenity and intelligence’ as his brief in completing the painting? Secondly If you belief otherwise.., how would make the difference if you were the artists given the commission? Peter Filzmaier • The photo is better than the painting but then thats usually the case when copying an original. Had the artist used some imagination and rendered the photo into an original expression, he might have still created some controversy but it could have been a work of art. Now it will always stand behind the creativity of the photo. Of course in summation blue is not her color. She is vibrant in reds and red violet. Herminia Haro • I like pictures of her in red more than the painting. A good technique for me in the painting but if I’ve had given the commission I would worked in a real scale first and having the model present (it’s not the same work from a picture) and capture the athmosphere around her and let brush marks visible. Patrizia lanzafame • Sono d’accordo con Herminia. E’ anche vero che un opera fotografata spesso perde, perchè non è la stessa cosa quando di va a vedere un dipindo direttamente. La fluidità delle pennellate sono belle e anche i colori, magari su qualche dettaglio, come occhi e vicino alla bocca, sempra che Kate sia avanti con l’età. Io non sto giudicando, ma è una mia impressione: anche perchè non ho mai visto di persona Kate, quindi non consco bene i tratti somatici. Alexandra Harley • Dull ! So utterly mainstream it really doesn’t do anything for me. Technically excellent it seems, but really bland and as such it doesn’t enhance the sitter and will not give any insight into her in years to come. Edyta Salak-Naideth • I feel the portrait screams for warmth. The overall grayness is aging and dull. There is no shine to her hair or complexion. The article states that the artist wanted to capture her lovely eye color and he did but the rest is off the mark. Mastering a technique doesn’t make a Masterpiece. The clothing is dull too ! The background provides no help. Why ? Close but no cigar in my opinion. Sunil Vilas • Herminia, Patrizia , Alexandra, and Edyta thank you for your visit today in the creative lounge.., adding wonderful perspective all relevant and helping to add value to our current topic. i look forward to more comments from members who are waiting to join us!! marjaleena . • Bad picture -not the best photo of her and maybe it was taken early in the morning…she looks like she missed some sleep!The artist is good on what he is doing’ but somebody mentioned “a lack of imagination” and I totally agree! Laurentiu Todie • At some point in time even the royals may have to wake up and smell the coffee. Modern art has been with us for more than a hundred years. Continuing to hang borring paintings in the portrait gallery only demonstrates their reluctance to progress. This being said, I don’t dislike them, but the painting makes me yawn. Vivienne Roberts • Sadly, the painter has not been able to capture the light this young woman radiates. Sunil Vilas • Avril, Marjaleena, Edgar, Laurentiu and Vivienne thank you all for your input..,Very interesting comments of how we all look at the same portrait painting very differently. This is what makes us all unique as artists and creative thinkers. I had an opportunity to visit Paul (the artist’s) website http://paulemsley.com/works/ where his black & white pencil drawings is quite interesting, what I see to be his best works!! Marc Aaron Senoner • For what concerns royal portraits I reckon it is not as bad as they say. I prefer it to the Queen’s portrait of 60 years ago. Peter Filzmaier • Perhaps a Kate Middleton portrait could be a theme juried by our peers and we could present the number one choice to the Royal Family. Alexandra Harley • Looking back through the comments, it seems there is not an overwhelming endorsement of this portrait. This is a shame because as Laurentui says, this is a missed opportunity and could have been so very different. However, I am sure the artist, presumably selected for his style, did his best in what were probably difficult circumstances and with clients with a seemingly very mainstream mindset. This is not a controversial portrait, just a dull/boring/ bland one. Alexandra Harley • An interesting thought Peter and one which should be taken up. Unfortunately I still think that the Family will go for something very predictable, the biggest problem as I see it. Worth a try though…..
Peter Filzmaier • Laurentiu, interesting article. Does the artist paint each circle individualy or does he use a cut out overlay of circles over a finished painting? Peter Filzmaier •Edgar, An interesting question. I wonder If Emsly has asked the same question of himself. To me to stay withing the comfort of acheiving a level of success that keeps you from evolving your work would remove the incentive to continue with the work but then I don’t know enough about the man and his prior work to know if my statement fits his situation. Laurentiu Todie • Peter, the artwork only exists in digital form so far. I just made it to use in this thread. Going further, I would paint or print it and use a black or white silkscreened mask on plexiglass to let the dots show through and to frame it. It is Pop Art (inspired by current events, Warhol, Dali, Close, Lichtenstein… I can explain) Thank you for the compliment! Heatherbell Barlow • Capturing the essence of a character in a portrait is a real talent. The painting is well painted but sadly falls short of reflecting Kate’s attractive sparkle. Maybe she will grow into the painting in time, or maybe not. This debate reminds me of that well known story in reverse by Oscar Wilde about the painting of Dorian Grey. Perhaps Kate will always look younger than her portrait! Didier Dubuy • The official portrait definately miss her original sparlle. & is this sparkle only physical ? Jan Ejsymontt • I agree with those who refer to the sparkle missing from the portrait of Kate Middleton Windsor. Film footage and photographs of her often capture a compassionate, thoughtful and caring women with a hint of mischief and sense of fun. When I look at this portrait, it captures none of this. The portrait is technically good, but the essence of the woman is not apparent, I feel no intrigue, or question about her personality, I do not search the face for emotions or moods. That blandness does not capture her essence at all. I doubt if she and her husband are truly happy with it whatever the brief was to the artist. Sunil Vilas • Good morning to you all thank you Marc, Peter, Alexandra, Edgar, Laurentiu, Heatherbell, Didier, and Jan for joining us in yet another topic that on a Tuesday is gathering a lot of interest. Our topic is aimed to cover our broad cross section of members around the Globe, even though you may have not have heard of Kate Middleton but as a subject of a portrait painting of a Royal family. What is your first impression? Let us all stick to our own personal views and experiences that matters to us all that is important here!! William Osmundsen • I gather the portrait was made after a photo. That is a hard and restrictive way to make a portrait. It seems to lack the expressiveness which would come from portrait sittings. You can have a handful of photographs and in my opinion none are equal to the artist’s eye. Peter Filzmaier • William, that works for me. There is nothing like painting a portrait live. Jan Ejsymontt • Apparently she did several sittings for him, but he also used a photo that was selected especially for the portrait. Benjamin Casiano • Agreed Peter. I wish I had the luxury of painting portraits. Unfortunately I don’t know anybody first hand that wants to be painted in a cubistic fashion. Peter Filzmaier • Benlamin, I’m sure Sunil and I could be your first subjects. Marc Aaron Senoner • Thank you Sunil. I like Emsley’s response to all the criticism http://read.bi/WmL1vG. I think a lot of talk whether good or bad is always positive for an artist. Anyway I don’t think there is anything wrong with using a picture to help you out, especially if you needed more sittings and several months to complete. If that was the case. Although I like the painting in its whole, it looks to me as if he changed that smile a couple of times, making it look a little unnatural. Well that’s my impression at least. Abbey Walmsley • An awful rush job like so much contemporary realism, it lacks life, shows none of her personality and is poorly executed. Shame to have to hang it in the national portrait gallery its an insult to the good portrait painters through the ages, Holbein would turn in his grave!. Edgar Plaute •… ich tue mir sehr schwer bei diesem Bild, denn ich bin wohl kaum ein qualifizierter Fachmann wie die meisten meiner Kommentatoren-Kollegen … darf ich daher in aller Bescheidenheit fragen: Ist dieses Bild tatsächlich so besonders schlecht? … ich kann mich an keine einzige positive Meinung erinnern … ist ein Maler der königlichen Familie vielleicht an einen ungeschriebenen Kodex bzw. Vorschriften gebunden, weil die “Queen amuzed” sein soll? … das ist ein geflügeltes Wort bei uns hier … und das frage ich als Nichtbrite die Briten in unserer Runde … warum ist dieses Gemälde so schlecht? in my English: … I’m doing very hard at this picture, because I’m hardly a qualified professional like most of my fellow commentators … I must therefore ask in all humility: Is this really so very bad? … I can not remember a single positive opinion … A painter of the royal family may be linked to an unwritten code or regulations, because the “Queen amuzed” should be? … which is a saying with us here … and I ask the British as a non Brit in our group … why this painting is so bad? 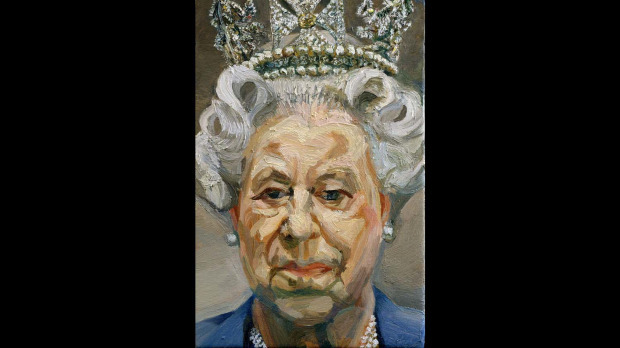 Laurentiu Todie • I didn’t particularly like Lucian Freud’s portrait of the Queen, but he’s tough competition in my book to any recent painters. Jan Ejsymontt • Laurentiu, yes that portrait of the Queen may not have been ‘likeable’, but it was fearless. Freud knew it would be controversial and did not baulk at that, he was true to himself as an artist, and that has to be admired. Laurentiu Todie • Intentional controversy is the new “charm” of art expression. I ignore it and look for other values but that makes for boring visits to some galleries and museum shows lately. Jan Ejsymontt • I think Edgar, that Freud stuck in part to his true style, but the portrait of the queen is rather caricature-like compared to most of his work. This may have been deliberate and actually, I suspect, condoned by the queen. There is a photograph of the queen sitting for the portrait on hydeordie.com. She is dressed in day wear, she would never wear that crown unless in state robes, was this a mutual sense of fun cooked up between the famously humorous Freud and the Queen is not without her own sense of fun. The kiss curls and the crown are much accentuated, again deliberate? The almost miniature size of the canvas is also amusing taken the greatness of the women…Freud courted controversy all his life, his portraits and nudes are often shockingly human and certainly not romanticised. In fact, Laurentiu, this aspect of intentional controversy could be the start of a whole new debate here. Laurentiu Todie • I wouldn’t mind intentional controversy if the artwork had esthetic value, but while Freud’s work does, most controversial art lately doesn’t or isn’t interesting from angles I appreciate. It has been suggested (not in this thread) that Kate’s portrait emulates Gerhard Richter’s photorealist style. While not so controversial to me, I looked at it from that perspective and it became a little more charming for a minute or two. Jan Ejsymontt • I agree with you Laurentiu about much of the current work by many ‘abstract expressionists’, it is neither fascinating, nor well executed. I find myself, of late, standing in the middle of places like the Stedelijk Museum in Amsterdam and looking at the contemporary galleries, bored and uninspired, and wondering why the curators have honoured such artists. I like the phrase ‘charmed for a minute or two’… some portraits can captivate for a lifetime, that says it all. Jenny Pagé • btw folks~I started another discussion separately from this one~and proposed Edgar’s previous question regarding artistry and technical ability…I thought it was a topic worth discussing…. Jelica Culafic • Kate has kind of what I call a photo rubber face – when photographed her features are dissimilar from picture to picture. In addition she grimaces a lot, and yet again there is a lot of photoshopping and censure in editorial photography. What does she look like in reality? Most of us have never met the woman in person as to be able to judge her character … or to closely study her visage. Her endeavors and achievements are not covered by the press. Then again, look at a close up of yourself (or of your model for that matter) and you will probably feel the odd. (by the way, my clients, more often than not, want some ‘plastic work’ done, otherwise they won’t purchase it). The artist and the model have selected the photograph together which makes the two accountable for the final result to some extent, and she did say it was impressive. Mind you, she has a degree in Art History and is supposed to have some preferences for aesthetics. She knows herself the best. 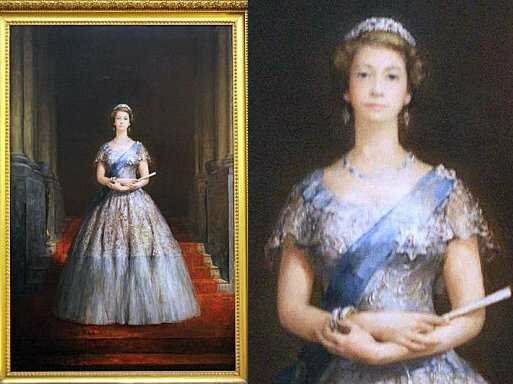 The photograph that Emsley used is non-edited and the painting is a good likeness of her physically. Personally, I am not a fan of sfumato, and would prefer the background more contrasted to the dress colour. Other than that, it reminds me of the wrinkle-free wax faces at Madame Tussauds, due to its size and imperfection-free complexion. This is a representational, official type of portraits, and it would be interesting to see it in the gallery space within the context. Has anybody gone to the gallery? 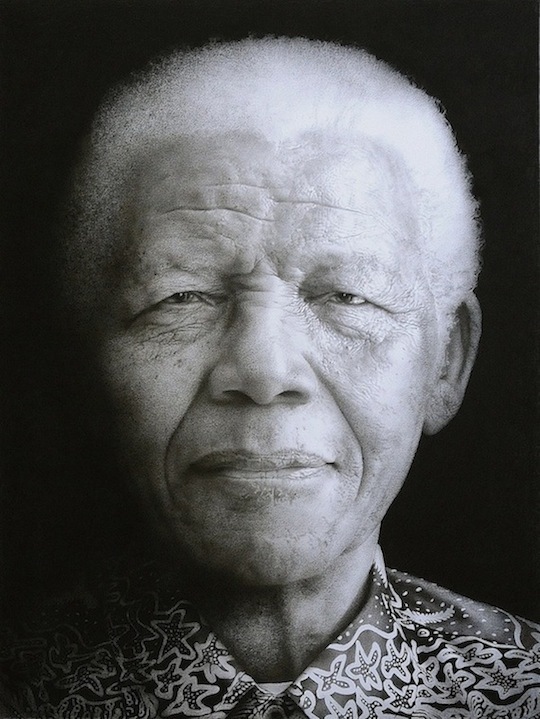 Mandela’s and Michael’s portraits are excellent … Mandela’s especially so. Sunil Vilas • Good Morning to William, Peter, Jan, Benjamin, Marc, Edgar, Abbey, Laurentiu, Jenny, Didier and Jelica. Thank you for joining us in our creative lounge with a topic that will leave many questions unanswered. 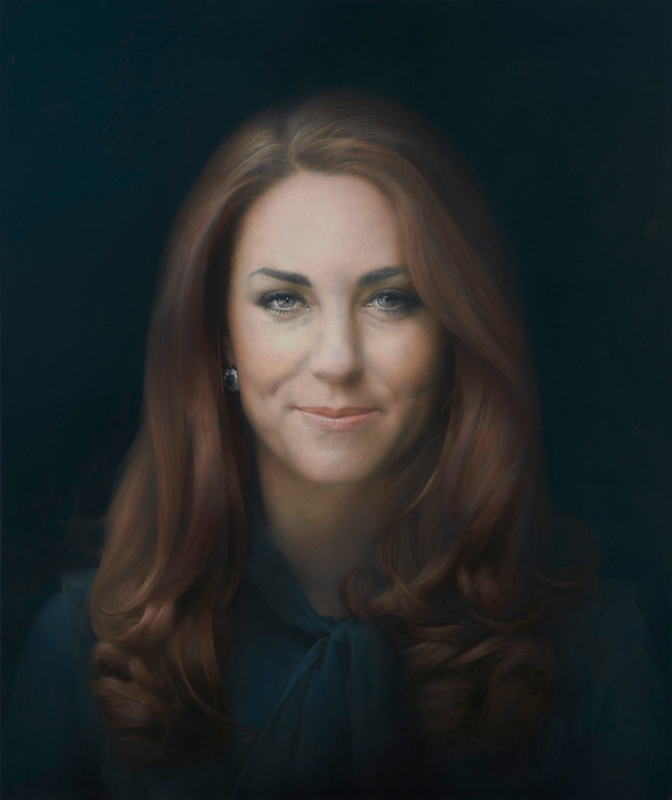 If I could clear any misunderstanding of how the portrait commission was completed as per the published records Paul the artist’s had the opportunity to have two sittings of The Duchess Kate Middleton, the first at Kensington Palace and the second at his studio. During these sitting had photographs taken that he later used as references to complete the painting. As a group what we want to achieve is to learn from our experiences of being both the viewer and artist’s, looking from both perspective, what is involved to complete a commission of this nature. Let us hear from our members who are photographer to get their views!! Perhaps if we go back to the brief for the portrait commission:- Artist wanted to capture her ‘charm, serenity and intelligence’ ‘The Duchess explained that she would like to be portrayed naturally – her natural self – as opposed to her official self. Jenny Pagé • Greeting Sunil! : ) You raise an interesting point in the request for perception from a photographer;which would e lovely if we were critiquing a photograph…However~ I stand by my previous statements and will add that (in my humble opinion) a painting rarely translates from a photograph very well.If she wanted to be portrayed naturally,there should have been more sittings, and the artist should have used these sittings primarily for the portrait~2 sittings unless they were beyond 3 hours long are not enough. Several life sittings,dependent upon the artist, at 3 hours each time would have been sufficient in completing it. She also while sitting for the portrait would have been more relaxed and “natural” as she sunk and relaxed into the pose…. the reality here is,the artist copied the photograph,and because of this he needed to add accouterments (sparkly eyes and fuzzy glow) to liven it up…because photos are deadened flat, 2 dimensional things with limited value range …that again,rarely translate well….into paintings…unless you are able to fake it wlll enough.Clearly this is not a successful attempt …IMHO…but then, why not just take a photograph? Sunil Vilas • Big hug, kisses and welcome to Jenny we lost you for a while good to see you back!! Hello to Edgar all this is very exciting and here to test our abilities in every senses, finding ways to look beyond the surface without actually seeing the painting in real life based our first impression. The comments we’ve had are all relevant and very good example of how each member/artist approach the portrait painting in his/her own experiences. 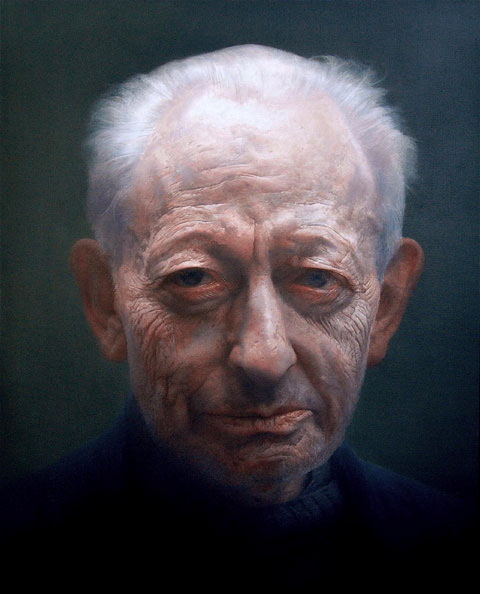 We also need to know that commissions like these are approved by a committee who would have shortlist the artists and in this case selected Paul Emsley the artist because of his record where he had won several prestigious awards including the 1997 BP Portrait Award. The portrait, which is likely to have cost upwards of £20,000, has been donated to the National portrait gallery by art philanthropist Sir Hugh Legatt. Lets us have more comments and views from artists waiting to join us!!! Mamta Sen • Looked like a haphazardly done job. the painting should have been at least shown to a select few for approval before making it to the walls of the Gallery..
Sunil Vilas • Mamta thank you for joining us in our creative lounge adding your valued comments to continue exploring answers to our debate!!! Didier Dubuy • This globalizationicas new page is simply fantastic Sunil, congratulations..
Julie Askew • Just stick the photo on the wall… why copy it ? never understood the point. Laurentiu Todie • What impressed me at first about the site was it’s political agenda and sexism. In the end it was it’s sarcastic marketing, but in the middle there were some straw-man assumptions and name dropping (da Vinci : ). I do not dispute the fact that Kate is a real human being, my vision is not infected by fashion magazine airbrushing and when I speak of something or someone “important” I also explain why that is so. I see the whole thing as an aggressive apology peppered with intelligence insulting. I consider the portrait boring, not ugly; I prefer art that makes an artistic effort, not a human camera with a sfumato-smirk filter. Jan Ejsymontt • Yes, Lautentiu the curator HAD to try to sell us, the viewer ,a positive view of the painting…..doesn’t want to loose his job, does he! What is a sfumato-smirk filter? Laurentiu Todie • I don’t blame him or anyone, I just make my observations. I don’t hate the painting; I just don’t see anything that I like in it as a work of art. Maybe if someone was really serious and explained real artistic qualities that I’m eventually not aware of, I’d listen. So far I didn’t hear anything compelling. I don’t dislike Kate, but I also like puppies and that doesn’t make me an admirer of the millions of sad-eye photographs on the Internet. Sunil Vilas • FEBRUARY 2013 – Monday 11th in the CREATIVE LOUNGE Meeting of wonderful minds around the globe.., following the path of creativity.., sharing precious moments .., and finding new friendships!! Hope you all had an enjoyable weekend break and firing on all full cylinder for an exciting week ahead! Welcome to our Creative Lounge Didier, Julie, Jan ,Laurentiu , Andy and Jenny. Our task is to explore all avenues together, the main elements being Art.., let’s not go in direction where we loose focus of our objectives, where comments we make will help us to better understand the whole process of undertaking a commission of this nature. You may not all receive a Royal commission it may be from a famous person, a pop star, or celebrity. But the same rule and thinking applies.., as an artist’s how you would handle yourself.., including all the criticism that follows after you complete the commission? 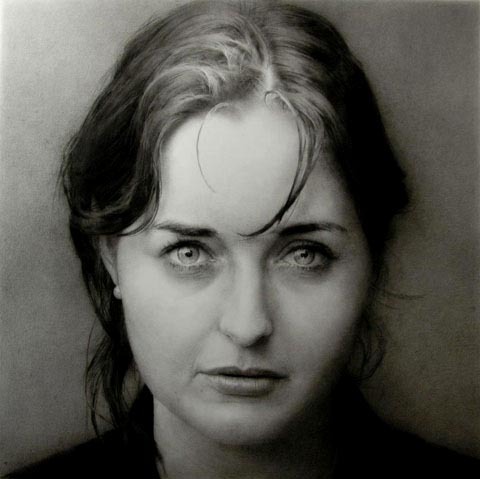 Understand Paul Emsley’s the artists position does his “Art” change in anyway? Mike Healey • Who said Kate’s new portrait should be photographically ‘accurate?’ When someone told Picasso that his new portrait (1906) of Gertrude Stein did not look like her, he famously replied: “She will”. Jan Ejsymontt • I’m open to superstar commissions also Laurentiu! Can I just tell the group that I have so enjoyed following this thread that I have started my very first attempt at a portrait….just to see if I can, I’ll post a picture when I dare! Mike I loved that quote from Picasso….maybe I too can use that one day! Laurentiu Todie • Good luck Jan! Mike, No one that I know of said that Kate’s new portrait should be photographically accurate. (this “debate” strategy is called “straw-man” : ) The Picasso quote is funny. Did she? Mike Healey • Absolutely! Alice was less thrilled, though! Laurentiu Todie • Babette did well till the [surviving] Steins stole her Picassos. Mike Healey • Edgar – SHE thought she was! sharing of precious moments.., bonding with members and finding new friendships!! Although the portrait is good, Kate has a million dollar smile. It would have been wonderful to see her flaunting her pearly whites in the painting. Option two. Showing her in a three quarter angle looking far more serious, maybe next to a window. I visited the National Portrait Gallery in London last weekend and saw the painting. I must say, it is much more impressive than the photographs….it certainly does not photograph well. It is well executed, larger than life with a profound realism. Flattering or not, it is a wonderful painting.